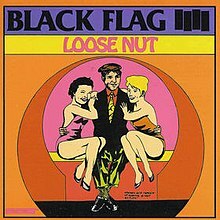 Loose Nut is the fifth full-length album by American band Black Flag, released in 1985 on SST Records. All tracks written by Greg Ginn, except where noted. Milo Aukerman – backing vocals on "Loose Nut"
^ Ogg, Alex. Loose Nut at AllMusic. Retrieved 2011-07-01. This page was last edited on 7 September 2018, at 07:20 (UTC).